If you’re reading this, you may be asking yourself whether you need an implant dentist near 77056. But before you schedule an appointment with a Houston oral surgeon or periodontist, you ought to consider the numerous benefits of dental implants. Those benefits, according to the American Academy of Implant Dentistry (AAID), include strength, durability, cost effectiveness, and protection and stimulation for natural dental bone. In addition, dental implants enable recipients to smile naturally—strangers and casual acquaintances will never know or notice the absence of missing or damaged teeth! With that in mind, Galleria Dental is an ideal solution for patients seeking a staff of implant dentists near 77056. Located on the bustling Richmond Strip in Houston, TX, Galleria Dental employs dentists that are skilled in the fields of prosthodontics, endodontics, orthodontics, as well as a wide variety of general and cosmetic dental procedures. Regardless of what your dental needs may be, Galleria Dental combines exceptional service with leading edge technology in order to achieve one primary goal: a beautiful, strong smile for all our patients. When considering an implant dentist near 77056, there are several factors that help Galleria Dental stand out from the rest. For one, Galleria Dental offers a full range of dental implant services, from single tooth and multiple tooth implants to full arch replacements. 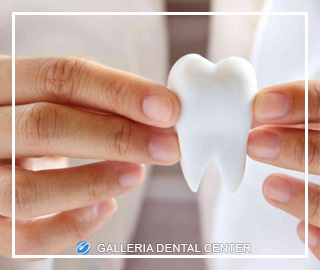 For another, the team of qualified doctors at Galleria Dental boast decades of professional experience and strive to provide you, the patient, with the highest possible level of dental care. Thanks to the efforts of talented implant dentists, you’ll have the benefit of replacement teeth, while appearing natural to the naked eye, give you superior strength, support and stability. If you’re worried about the procedures used by implant dentists near 77056, you can rest assured with Galleria Dental. This Houston-area dental clinic is populated by trained prosthodontists with the necessary experience to perform dental implant procedures. These implants are typically made of titanium because it’s a biocompatible material that naturally incorporates itself into the mouth’s existing structure. A Galleria Dental specialist that studies supporting tooth structures, also known as a periodontist, installs the implants surgically via the upper or lower jawbone so that they remain firmly in place and blend seamlessly with pre-existing teeth. All things considered, Galleria Dental should top your list of implant dentists near 77056. Their dental implants allow patients to improve their speaking ability, relieve jaw and cheek pain, restore natural chewing and drinking functions, and so much more. Scheduling a dental clinic appointment is as easy as completing an online form or by calling (713) 960-9926. Let the dental implant experts restore the state of your smile!